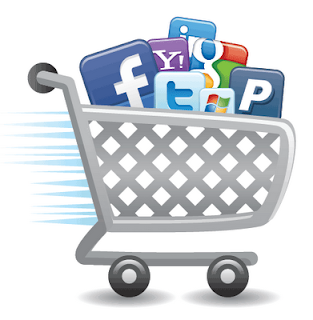 This month on the blog we will be discussing what we love about Social Commerce. We aim to talk about word of mouth marketing, social commerce websites we like, integrating your shop with Facebook and social commerce functionality we recommend. Retail / E-Tail has entered a new phrase where product discovery and purchase decisions are informed by the collective and distributed via social intelligence of peoples’ own networks of interactions/social graphs. There are a number of websites that encourage social discovery of products found online; two of our favourites for social discovery of products are Polyvore and Kaboodle. Social commerce is not new; Amazon's customer reviews and Ebay's groups could be classed as early examples of social commerce. The term has come back in the lime light, with announcement of Facebook Credits and news that some of our favourite brands have set up a Facebook shop. Of late there have also been some clear winners in social commerce, with Groupon (a social deal site) reported as being the fastest growing company ever. Furthermore, within our industry there are many stories about brands making their website more social, for example integrating Facebook plugins to their websites. There was a recent survey of Facebook users (by 8th Bridge) which found that one third of Facebook users prefer never to leave Facebook for functionality, including shopping, suggesting that Facebook is morphing into a social commerce platform giving further insight that is people not brands that are driving social commerce. However, in contradiction to that point, it must be noted that, social commerce on Facebook is yet to make its mark in the UK. The IAB recently reported (5th July 2011) that a survey found that 89% of UK social networkers have yet to buy anything from Facebook and with 44% not interested in doing so. From the same study, the IAB found that “tapping into the power of online recommendations and the influence of friends is essential to make UK shopping more social. Some 53% of consumers were more likely to look up information about a brand if a friend had recommended it, and almost one fifth (17%) stated they were likely http://www.blogger.com/img/blank.gifto buy from a brand if it was recommended by someone they knew” Read more about the IAB study on UK social shopping behaviours here on the IABUK website. Common questions include: How will their customers recommend them to others? Are our customers likely to rave about our latest products? Would they be interested in sending a coupon to friends? Which social media channel i.e. : Facebook, Twitter, should we use? How will this relate to our overall business objectives? Which social share icons will be useful for our customers and for overall website growth? Rocktime are regularly making changes to their client websites to enable them to create a more social shopping experience. Where appropriate they are advising their clients to add appropriate social share icons, where possible think niche, to mine and nurture their brand ambassadors and to monitor customer behaviour to maximise return on investment from social activities, i.e. : identifying that competitions are best run at lunch time. Word of mouth has always influenced purchase decisions; we are encouraging clients to bring reviews onto their site for social and SEO benefits and to enable site visitors the option to spread news of their reviews / interaction further. This is based on the fact that 90% of purchasing decisions are subject to social influence (Wired magazine, 2011). According to research from Booz and Company (May 2011) it is expected that the social commerce market will soar to $30 billion by 2015. It was also interesting to find out recently that the most active social sharers are women aged 27 to 33; this demographic also drives the highest conversions on social media sites (Research from Spinback, reported in Mashable 12/05/2011). Social Commerce functionality will include, but by no means limited to, RSS Feeds, User Generated Content, Social Share Functionality, Social Network Integration, Social Layering, Communities and Niche Groups/Messages. If you have questions on how you can effectively implement a Social Commerce strategy and are unsure about the best route to take, please call in and talk to a member of our Sales team. With our active ‘Social Commerce’ internal steering group, you can be positive that we will be on the ball with the most up to date trends and social functionality. If you have any further social commerce statistics that you would like to share with us, feel free to leave a comment below. 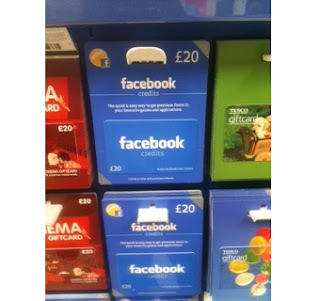 Image credit goes to Sarah, who snapped the Facebook Credit Cards in her local Tescos and for the second image credit goes to the Janrain Blog who write about the four emerging social commerce tools for retailers.